Many people confuse isotonic and isometric exercise. That's not surprising, since both sound similar; however, there is a major difference between how the two types of exericses are performed. The prefix iso- means uniform or equal. It is in the root of the words isometric and isotonic exercise where the difference lies. Isotonic means exerting equal resistance while the length of the muscle changes. Isometric means exerting an equal resistance while the muscle remains in a fixed position. Performing crunches flexes your abdominal muscles, while performing dead lifts extends your erector spinae. Performing a biceps curl first flexes the biceps as you raise the weight, and then extends them as you lower it. Bench presses flex chest muscles as you raise the weight, and extend them as you lower it. While flexion and extension describe the movement of the muscles during isotonic exercise, weights provide the equal resistance throughout the range of motion. Other exercise equipment that provides isotonic exercise includes resistance bands, body weight calisthenics and weight machines. Isotonic exercise builds both muscular strength and endurance, two of the five components of physical fitness. Depending on your goals, you may perform high repetitions with lighter resistance or lower repetitions with heavier resistance. You can also increase the intensity of isotonic exercise by slowing down the repetitions so that you exert careful control over your muscles throughout the entire flexion and extension phases. If you are new to isotonic exercise, it is best to start with light weights and gradually lift heavier ones as your strength improves. Isometric exercise involves contracting and holding a muscle or group of muscles. When competitive bodybuilders flex their muscles and hold the position for judges, they are performing a form of isometric exercises. You can flex and hold most of the major muscle groups throughout your body to perform isometrics. The trick lies in learning how to isolate the each muscle group in order to contract them. You can perform an isometric right now. Tighten your stomach muscles, as if you expect someone to punch you in the stomach and you want to steel yourself against it. When you tighten and hold your stomach muscles in this way, you are isometrically contracting your rectus abdominus, which is the main muscle in your stomach region. Kegel exercises to build pelvic strength are another example of isometric exercises. Another type of isometric exercise occurs when you lift something heavy and carry it in a fixed position. For instance, if you hold a heavy box in front of you with your arms flexed, you are isometrically contracting your biceps muscles. Like isotonic exercises, isometric exercises also increase both muscular strength and endurance. Because the movements are subtle and require little motion, it is easy to perform isometric exercises anywhere. Many "desk exercise" workout routines feature isometric exercises where you stop, flex and hold different muscle groups as you sit at your desk. This type of exercise works well for people who lack space or equipment, as well as those who have sustained injuries that prevent them from experiencing full range of motion. If you are new to isometric exercise, begin with short contractions, and only repeat each contraction a few times. As you gain strength, you can begin to hold the contractions longer and repeat them more often. Always warm up before exercising and cool down afterward. Combine strength training with cardiovascular activity and stretching in order to cover all areas of fitness. Get adequate rest between workouts. Always allow 24 to 48 hours between strength training sessions. Work with a trainer to learn proper methods for both types of exercise. 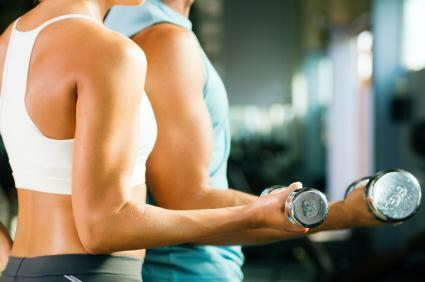 Muscular strength and endurance are an important part of your overall level of fitness. Incorporating either isotonic or isometric exercise, or a combination thereof, can you lead a healthier life.